This may be one of the creepiest photographs I've seen of a politician. It's made even creepier by the fact that this is a politician with whom I've agreed many times in the past. 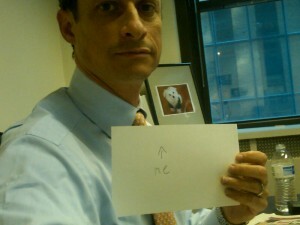 And the fact that the arrow pointing to 'Me' is actually pointing to a photo of an adorable little white dog in the back of the Anthony Weiner's office. But all things, even the most random and innocent objects look somehow obscene and creepy when you put a small sign that says 'Me' next to them. @Aimee--Hopefully, this post wasn't too much of an appetite-killer!